The 2018-19 Think & Drink series presents four provocative conversations about journalism and justice. Join renowned writers at the Alberta Rose Theatre in Portland to explore questions relating to white nationalism, militia movements, war, police violence, and mass incarceration. 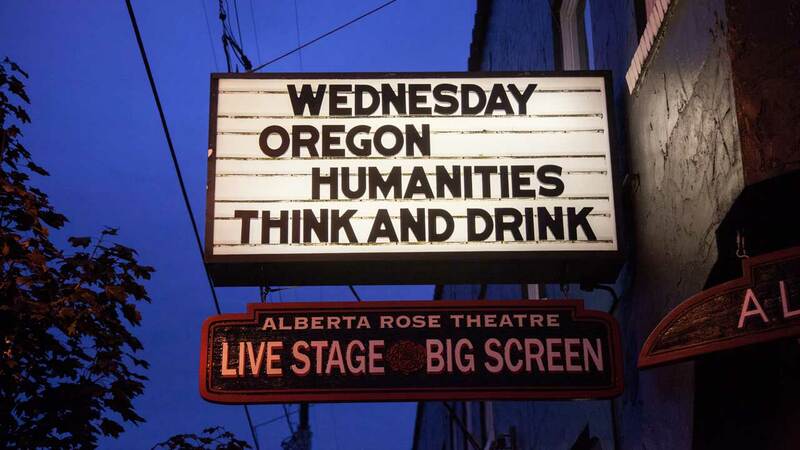 Think & Drink takes place at the Alberta Rose Theatre, 3000 NE Alberta St., in Portland, from 7:00 to 8:30 p.m. We invite you to stay after the program for snacks and conversation. Minors are welcome when accompanied by an adult. No-cost tickets are available for all Think & Drink events. October 24: Eli Saslow, staff writer for the Washington Post and author of Rising Out of Hatred: The Awakening of a Former White Nationalist, in conversation with Emily Harris, reporter and producer for the Center for Investigative Reporting’s Reveal podcast. January 23: Journalists Les Zaitz, Inara Verzemnieks, and Kimberly A.C. Wilson, all former Oregonian reporters and Pulitzer Prize finalists, in conversation with Adam Davis, executive director of Oregon Humanities. This event is sponsored in part by the Andrew W. Mellon Foundation's "Democracy and the Informed Citizen" initiative, which seeks to deepen the public’s knowledge and appreciation of the vital connections among democracy, the humanities, journalism, and an informed citizenry. The 2018–19 Think & Drink series is made possible thanks to the support of the National Endowment for the Humanities, the Oregon Cultural Trust, Stoel Rives LLP, Tonkon Torp LLP, Northwest Natural, and the Kinsman Foundation. Our media sponsors for the 2018–19 series are Bridgeliner and XRAY.fm. Questions about Think & Drink? Please contact Ben Waterhouse at b.waterhouse@oregonhumanities.org. Join journalist Eli Saslow, author of Rising Out of Hatred: The Awakening of a Former White Nationalist for a conversation about how white supremacist movements are born and how they gain power.